SO YOU THINK (NZ) (Bay or Brown 2006-Stud 2012). 14 wins-1 at 2, MVRC WS Cox P., Gr.1-twice. Sire of 371 rnrs, 202 wnrs, 15 SW, inc. La Bella Diosa (New Zealand One Thousand Guineas, Gr.1), Nakeeta Jane, Sopressa, D'Argento, Inference, Gold Rush, Heavenly Thought, Higher Ground, Think Bleue, The Pinnacle, Northwest Passage, Global Thinking, Marathon Man, Care to Think, So Si Bon, SP Harvestfortheworld, Light Up the Room, Coral Coast, etc. DAYTIME, by Choisir. Raced once. 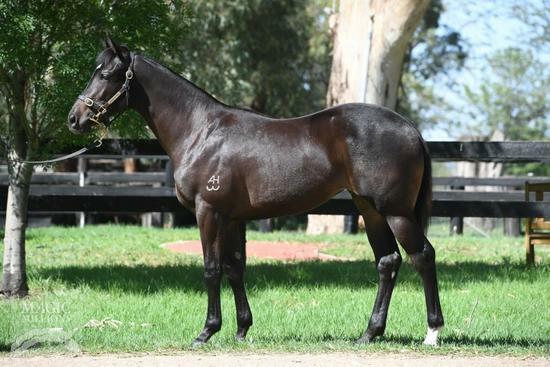 Half-sister to Altitude (dam of EXOSPHERE). This is her second foal. Her first foal is a 2YO. He's a Moral. 5 wins to 1250m, A$174,980, to 2017-18, SAJC Seppeltsfield H., 2d MRC Jack Dunn H., William Hill H., SAJC Matt Tarrant Magic H., 3d GCTC Magic Millions Country Cup, MRC Ladbrokes Odds Boost H., MVRC CRT Davey Dash H.
EXOSPHERE (Lonhro). 5 wins-2 at 2-to 1400m, A$1,091,600, ATC Golden Rose S., Gr.1, Roman Consul S., Gr.2, Run to the Rose H., Gr.2, Skyline S., Gr.2, 4th VRC Lightning S., Gr.1, Coolmore Stud S., Gr.1. Burke's Luck. 4 wins from 2000m to 2600m, R307,775, 2d Turffontein Racing Express Profile H.
Shengmu. 4 wins-1 at 2-at 1000m, A$278,000, WATC Westspeed 3YO H.-twice, Vale Bob Howat H., Westspeed Nursery H., 2d WATC Seacorp H., 3d WATC Westspeed Nursery H.
Scalpel. 2 wins at 1000m, A$98,340, 2d WATC Amelia Park Lodge H., 3d WATC Tabtouch H.
VIBRANT VIRGO (Zabaleta). 7 wins from 1200m to 2400m, 638,761Rgt. in Malaysia, Perak Derby, L, Selangor TC Otard Cup, 2d Perak TC Coronation Cup, L, Selangor TC Piala Emas Sultan Selangor, L, Singapore TC Queen Elizabeth II Cup, L, Singapore Gold Cup, L, 3d Perak TC Coronation Cup, L, Singapore TC Raffles Cup, L, Class 1 H., Perak TC Class 1 H.
WAR ROOM (War Chant). 3 wins to 1400m, A$133,300, in 2017-18, WATC Sir Ernest Lee-Steere Classic, L.
Highest (Marscay). 2 wins. See above. Danzig. 7 wins-1 at 2-to 1200m, WATC Budget Rent-A-Car Sprint H., Cygnet H., 2d WATC Pioneers H., Azalia H., Saratov H., 4th WATC Sir Ernest Lee-Steere Classic, Gr.3. Soldier On. 2 wins at 1000m, 1400m, HKJC Tong Fuk H., Wong Chuk Hang H., 2d HKJC Link H., Shing Mun River Channel H., Leiria H., Tsing Yi H., Mirs Bay H., Mount Collinson H., 3d HKJC Macwhinnie Cup H., Schnitzer H.